When it’s hot or humid, a glass of coldwater is too boring but nearly all the cold flavored drinks in the market are full of preservatives, sugar, or artificial sweeteners. If that’s the case, why not make your own cold but healthy drink? Whether it’s for weight loss or you just want a sweet way to cool down, infused water can help you start your day right or give you a sweet treat that gives you the benefit of fruits and hydrating water. In this article, I want to talk about infused water and a lesser-known flavor, peach water. Infused water has a lot of names: detox water, fruit-flavored water, fruit-infused water, and many more. 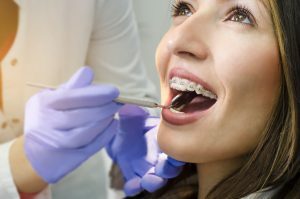 It’s similar to the way you make tea or coffee: you steep the flavor of tea leaves or coffee beans in hot water, strain the solid bits away, and drink the coffee or tea compounds mixed in with the water. However, in infused water, you don’t have to steep the fruits and/or vegetables in hot water and can drink it cold. 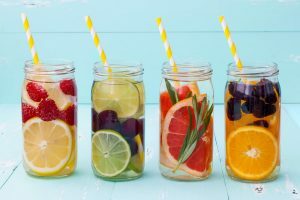 Infused water is usually made with fruits, but some people enjoy making flavor combinations with both fruits and vegetables. The result of infusing fruits and vegetables with water is that you get the hydrating benefits of water, the calorie-free flavor, and the health benefits provided by the fruit or vegetable of your choice. There’s no evidence to support how long people have been drinking infused water, but the technique of steeping plants into our drinking water for medicine dates back to the 10th or 11th century, when essential oils were supposedly first used. Tea, however, dates back centuries, and it’s been practiced by ancient Chinese civilization before the practice spread to the rest of the world. Back then, however, infusions were made with hot water, since there were still no easy means of refrigeration. Cold infusions may have been practiced as early as 1834. By then, artificial refrigeration was invented, and people had access to cold water. It’s hard to be sure when infused water originally started, but it became popular around the late 2000’s when the market for health and wellness grew and people were looking for healthy ways to detox. Unlike manufactured flavored water and other bottled drinks you’ll find in the supermarket, homemade infused water has no preservatives. Even some of the cold drinks in your supermarket that are marketed as diet products or sugar-free have artificial sweeteners or additional ingredients you can’t even pronounced. Infused water, on the other hand, has zero calories (it’s basically water and the flavor compounds of fruit, not the fruit itself) and you know exactly what goes into your drink. The benefits you can expect to receive depend on the fruits and vegetables you’re drinking. 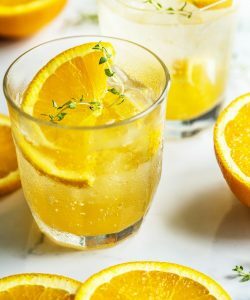 For example, citrus fruits are filled with vitamin C to help lower blood pressure and stroke while mint can improve indigestion and irritable bowel syndrome. Be sure to do your research first on the fruits and vegetables you want to drink. In general, however, all infused water flavors offer some similar benefits. After a long and hot day, a cold glass of flavored water can greatly improve your mood. Its nutrients help your liver flush toxins out of your digestive system, cleaning it of waste and other harmful particles. Flavored water can help you want to drink more, especially if you don’t like drinking a lot of flavorless water. Drinking plenty of water before the start of every meal can help you eat less. Water can help your body dissolve fat cells, which help you lose weight with water weight loss. Water helps several body systems and help you stay less fatigued in high-movement activities. Apart from detoxing, more people drink water to lose weight because studies have found that it has led to better long-term weight loss. Making infused water is simple. Simply put fruit or vegetables of your choice in a pitcher, water jug, or water container, fill it with clean drinking water, and then leave it in your refrigerator for at least four hours or, if you can, overnight. Serve it in a glass filled with ice cubes if you prefer it to be ice cold. If you want to add more fun to your drink, serve it in wine glasses. You can also mix in fizzy water if you want your drink to be a little bubbly. You can use any pitcher or water bottle you have at home. If you use a regular pitcher, you may have to strain the seeds, sprigs. You may also have to strain the pulp as well, if you’re not a fan or drinking it. However, if you want to forego this hassle, you have the choice of buying a fruit-infused water or water infuser bottle or pitcher. Infuser containers feature a chamber where you place you place your fruits. The chambers have holes where water can pass through and the fruit compounds can mix into the water without seeds or other solid parts can slip out and into your glass. A few pulp bits may get in the way, depending on the fruit or vegetable you use, but these are very small bits that you won’t notice when you drink. If you’re looking for infused water containers, the type you’ll want will depend on your drinking habits. If you’re planning to serve flavored water to a lot of people in your home, you’ll want a large but simple fruit infusion pitcher. Or if you want to create fruit water in large amounts, here’s a beverage dispenser that can hold up to three gallons. If it can’t fit in your fridge, just make the flavored water four hours before your party and then add ice to make it cold. Smaller options are also available. Water jugs provide smaller servings of flavored water if you’re making it just for yourself. However, there are many variants in the market. These infuser water bottles, for example, have much larger chambers. So, you get more fruit and flavor, but less juice. On the other hand, this water infuser bottle is leak-proof and insulated and features a smaller chamber, meaning you get less space for fruits and vegetables, but more juice that stays colder for longer. When buying water infusers, be sure to think ahead and which products best suits you. Apart from peach flavored water, the combinations of fruit and/or vegetables are limitless, depending on your taste preference and imagination. 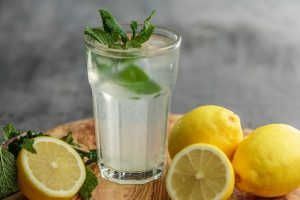 The most popular one is lemon water – you’ll find many restaurants serving water infused with lemons over any other infusions – as well as lemon mixed with cucumbers. I personally like strawberry lemon water, but when I tried infused water with peach, I’ll admit I was a little skeptical at first. But the sweetness of the peach infused into the crisp, cold, and refreshing water was a great balance. So, I recommend that everyone should try different infusion flavors before finding a blend they best like. These fuzzy fruits are a member of the stone fruit family, providing similar benefits to cherries, plums, and nectarines while providing that distinctly sweet flavor.Peaches contain anthocyanins, chlorogenic acids, quercetins, and catechins, which are known to decrease the risk of obesity-related diseases such as diabetes and cardiovascular disease. Its nutrients are also known to have compounds that help anti-inflammatory properties that reduce bad cholesterol. Peaches are rich in vitamin C like citrus fruits. This is a good source of antioxidants, which help reduce free radicals known to cause cancer. It also helps produce collagen to prevent skin aging and damage due to the sun and external pollutants. Canned, Frozen, or Fresh Peaches? When you buy your peaches, you have the option to purchase canned, frozen, or fresh peaches. I would always recommend frozen or fresh peaches, but I know that in several places (especially in countries where peaches aren’t a locally-grown fruit, it might be impossible to get these. Canned peaches are fine if you don’t have an alternative, but be sure to buy canned peaches in water or juice. Peaches in heavy or light syrup absorbs plenty of sugar and, added to the water, become unhealthy and add too much unnecessary calories into your peach water. Frozen peaches are a good option if you don’t want to go through the hassle of peeling, slicing, pitting, and removing peach skins yourself. It’s already ready for you to use. However, if you buy fresh peaches, you will find that it’s very soft and can easily be squished and blended into water, so you’ll also want to freeze fresh peaches. Before doing so, be sure to buy slightly firmer peaches rather than the traditional way of finding the softest ones. Freezing peaches are an easy additional step. First, peel your peaches and slice them into equal slices. While peeling your peaches isn’t necessary, I find it much more convenient to do this when it’s still a whole peach rather than peeling it once it’s been sliced. Here’s a helpful article from The Spruce Eats on how to perfectly slice your peaches. It’s not necessary to make perfect slices when you’re putting them into your pitcher, but you’ll want it to look nice if you’re serving peach water to your guests. Put the slices on a baking sheet. I recommend lining your tray with parchment or wax paper so it will be much easier to remove the peaches and clean the tray. If you’re freezing plenty of slices, avoid letting them contact each other so that the cold can fully work its way throughout each slice. If you freeze them in clumps, it will be more difficult to separate them when you need it. And the faster they freeze, the better their texture will be once placed in water. Leave your tray in a freezer for at least four hours or overnight. Once they’re frozen, transfer them to a resealable plastic bag and try to get as much air out as possible before sealing. If you have a vacuum sealer, use this to remove all the air. This prevents your peaches from going bad while frozen. 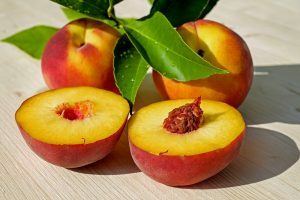 You can keep frozen peaches in your refrigerator freezer for up to half a month, but it can last up to one year in heavy-duty, stand-alone freezers. Start by preparing your peaches. If they’re canned, drain them and add them into your pitcher or water jug. Or if they’re frozen, simply take them out of the freezer and place them in your container. Add enough water and let it sit for four hours or overnight. How much peaches would depend on how much can fit in your fruit chamber or how strong you want the peach flavored-water to be. But normally, I would recommend around 10 peach slices. While it steeps, your frozen peaches should thaw out and release its juices and sweet flavor. If left for enough hours and with enough fruit to saturate the mixture, your peach water should have a sweet taste as is. But, if you want it to be sweeter, serve your peach water in a glass filled with ice and a few peach slices. You can also drop a few teaspoons of vanilla to make it sweeter but try to use natural vanilla if you want it to stay a healthy drink. You can refill your pitcher and reuse your peach slices, but note that the flavor gets weaker with every round. And other fruits such as nectarines and apples. Spices such as cinnamon, paprika, and ginger. If you’re making peach water for a party or event, you’ll want to prepare multiple pitchers of flavored water ahead of time. While you can re-use the same fruits and refill the pitcher up to eight times (or until it loses its flavor), refilling the same pitcher and serving it immediately can result in flavorless water or infused water with a weak hint of peach. Peaches need time to steep to infuse its flavor into the water. After emptying out one pitcher, refill that pitcher with water. Place it in the fridge to let it infuse for a while and then serve another chilled pitcher. 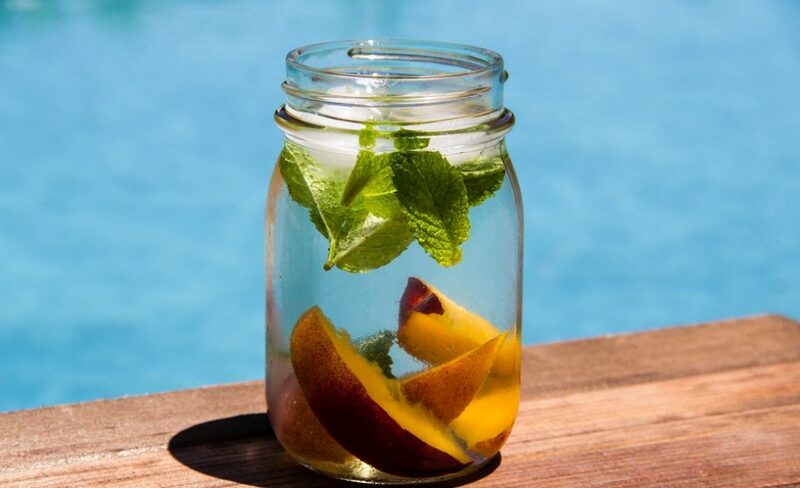 While drinking infused peach water can be a delicious and refreshing treat, always remember to drink in moderation. Pure water can be just as healthy, and too much of something can’t always be good. 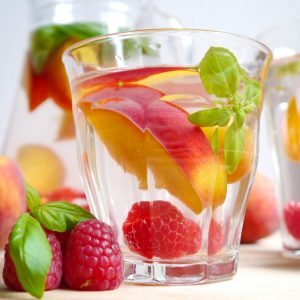 But if you’re looking for a healthier but sweet drink, try infusing your water with peach and a combination of fruits and vegetables that you find interesting.